I can’t believe next week is Christmas, holy cow. 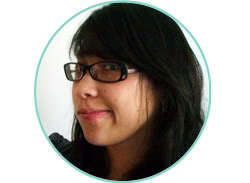 This week the theme for Top Ten Tuesday with The Broke and the Bookish is Favorite Reads of 2012. So without further delay here are some of the book that stood out that were released in 2012 (or that I read this year and just had to mention again) I tried to do different books than I did last week with favorite authors of 2012 because seriously it’s so hard to narrow it down to ten each week. I’ve raved about all of these before so I’m keeping the descriptions short but if you click on the links you can read more about each one. Also be sure to connect with me on Goodreads. Cinder – great Cinderella retelling but with Sci-fi awesomeness and a super appealing prince. Grave Mercy – teen nun assassins, love, gorgeous dresses and loads of action. Insignia – the Ender’s game fan and video game con going girl in me loved this. Fun story with great friends. Shadow and Bone – yes it’s I’m talking about this book again. one of the best villians ever, awesome fantasy, and super original story. Throne of Glass -oh yeah this one too, but seriously guys I loved it. Fighting awesomeness, some crush worthy boys, super cool story, and a heroine that stays up late reading even though she’s got to fight for her life the next day. Partials – a great dystopian with a medical bent. Action packed and great for Hunger Games fans. Crown of Embers – Best.Sequel.Ever. okay maybe tied for Ender’s Shadow. But boy oh boy I adore this book. Yup, a great, real, relatable and strong heroine,fun story, and kissing in sewers weeee! Dash and Lily’s Book of Dares – this is not new this year but I read it in 2012 and loved it. Definitely my favorite contemporary read. such a darling story, very sweet, fun and quirky and as a bonus could definitely pass as a christmas/winter book. Plus squeely!!! The Adoration of Jenna Fox – another older but new to me. This book was awesome. Great story with wonderful family dynamics that tickled the philosopher in me. Questions of what counts as a person, how far would you go for someone you loved, and other bio-ethicy themes. And since I made a bookish ornament that was super easy over the weekend I figured I’d share. 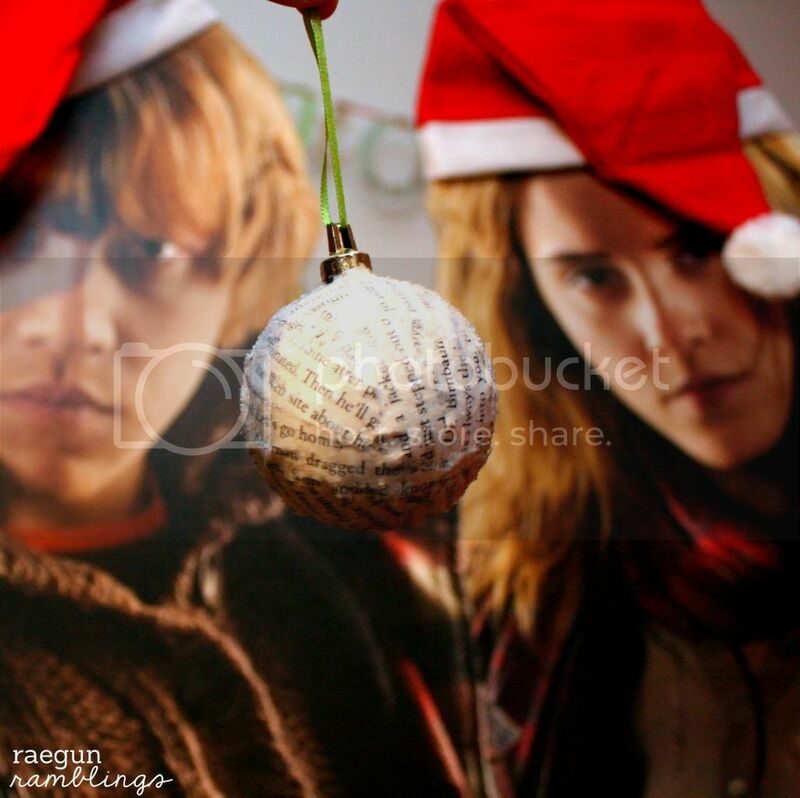 Even Ron and Hermione think it’s cool. Plus they are super fast and easy if you need a gift for a book geek. All you need is a plastic ornament, a page from a book, mod podge, loose glitter, some clear spray paint and some ribbon. 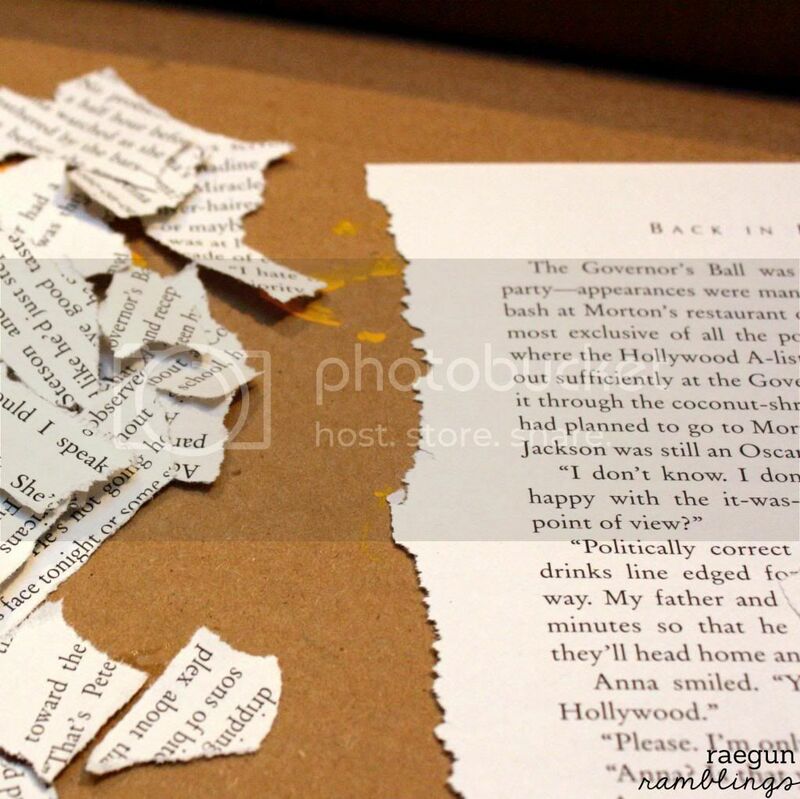 Just tear the page in pieces. 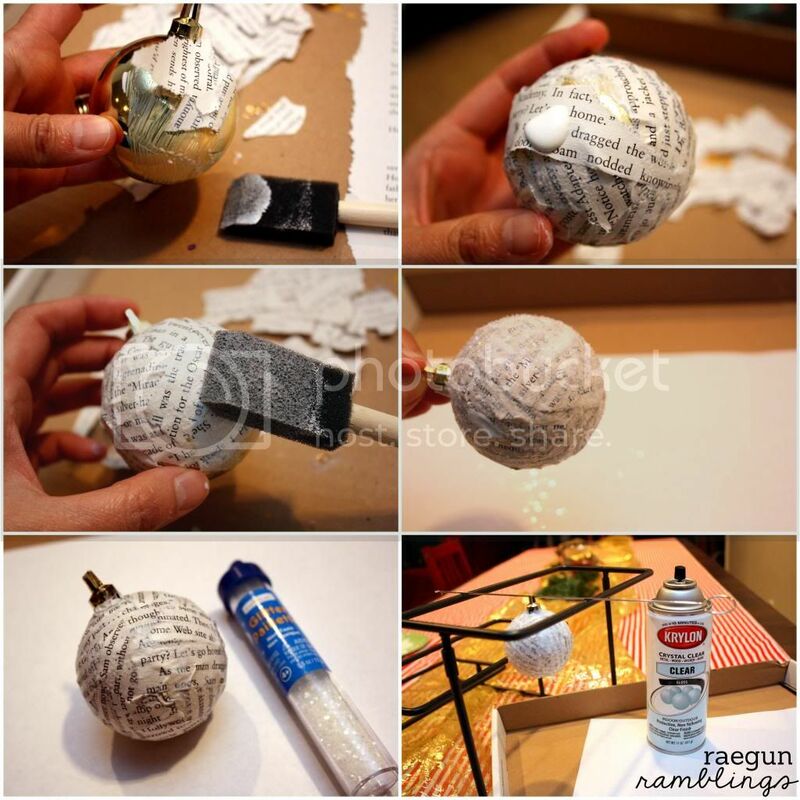 Paint some mod podge onto the ornament lay the pieces on top and paint more mod podge all over. Repeat until covered. Then add another layer of mod podge and sprinkle glitter on top. Allow to dry. Then spray with some clear spray paint, add a ribbon and you’re good to go! Merry Christmas everyone. Great picks. My to-read list just got even bigger. Thanks. Lily and Dash is so cute. Loved it. Great list! The only one I’ve read is Shadow and Bone; it was good! Thanks for sharing and stopping by! Yay, I loved Cinder! Such a great read. I’m dying to read Insignia, I bought it recently and am trying to make room for it. Awesome list! Cinder is definitely up there on my list of books I NEED to read!! Thanks for stopping by My TTT and that ornament is darling, I may have to make one if I can get myself to hurt a book haha! Ooh loving this list because there are so many books on it that I want to read – I read Girl of Fire and Thorns but haven’t gotten to The Crown of Embers yet – so excited to see it made your top 10. Gotta get it now :-) And I love Cinder! I have loved all of Dan Wells books but need to read Partials, glad to see it on your list. Really nice ornament indeed, thanks for sharing. Fabulous list! I loved Cinder and I am still trying to get to Partials and Dash and Lily. Oh, and I love the ornament tutorial. I have all that stuff, so I am going to try a couple this afternoon. I also have Cinder and Adoration of Jenna Fox on my list for this year too! I was a little skeptical of a cyborg Cinderella when I heard about it but Marissa Meyer pulled it off! Cinder is so clever and I devoured it! I was surprised to see someone else with the Adoration of Jenna Fox on their list since it has been out for awhile now! That book (kinda like Cinder too I guess) made you think about what it means to be human. I’ve already bought Shadow of Bone and Throne of Glass and can’t wait to read them! Love this idea. I just have such a hard time tearing up any book. Maybe I can find some old ratty book. But then I want a certain book – and when I find the certain book it will be that struggle all over again. sigh. Maybe I should print it out on my printer instead of ripping a book. I keep seeing Dash and Lily’s Book of Dares pop up everywhere! I need it… By the way, I just checked out your Etsy shop – you are so freaking talented! All I need is for some friends to start making babies and I will definitely be buying from you! Aww. What a cute idea! Fun bookish ornament! I’ll have to try to make those for gifts next year. Glad to see Dash & Lily made the cut..it’s one of my all-time faves. Throne of Glass, Insignia and Cinder are all books I enjoyed too. I need to catch up with Grave Mercy and Shadow and Bone soon, especially since it’s appeared on so many lists! Oh I just got a book at the dollar store that looked terrible. Even though I’ve got books on my shelf that I don’t plan on reading again and weren’t particularly good I still can’t destroy a reading book so yes I have to buy books specifically for crafting haha. We have similar taste because we had four in common! (Shadow and Bone, Grave Mercy, The Adoration of Jenna Fox and Cinder). The Rae Carson books and Throne of Glass are on my short list to read. And I’ve heard of Dash & Lily before, but it fell of my radar. May have to look it up again! All of these. Just…all of them. Gah! I really want to read Shadow and Bone and Grave Mercy, in particular. I hope you read as many wonderful books and more in 2013! 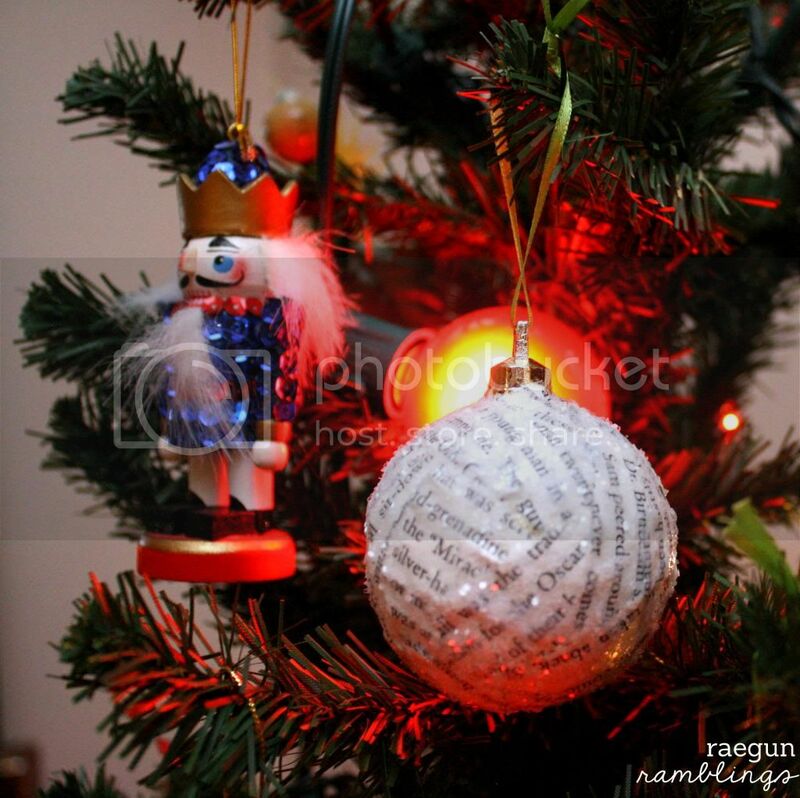 This is a great list and OMG I love your Bookish ornaments!! Cinder, Throne of Glass and SHadow and Bone seem to keep popping up everywhere, I think I’ll have to read those. As for the bookish ornament, I discovered these beautiful things last night while I was searching for DIY gifts for the holidays. I plan on making at least a couple of these, haha. Great list, and great gift idea! CINDER! I love that book! All the others are definitely top priority for 2013! :) Oh, and I LOVE that ornament!! Very cute! I read City of Bones this year and liked it (can’t wait for the movie) so I’m glad to see you have one of the series on this list. Thanks for stopping by today! You’re right! We have so many books in common on the list! Haven’t started on City of Lost Souls though, I’m not in the mood for it yet. I love Shadow and Bone too. but I got a little lost there during the beginning. And Partials was just as awesome even though it gave me a bit of a headache catching up to the scientific parts. P.S. Regarding Stormdancer, I have to admit during the first parts I was ready to give up on it. Things were to confusing and it got off real slow, not to mention there was to much descriptions and all BUT once Buruu came into picture, everything went from dull to epic awesomeness. If you happen to try reading it again, I hope you enjoy it. Partials and Grave Mercy were SO good! I can’t wait to read Insignia! This ornament is SO COOL! I always love when you post your favorite books. I’ve read about half and I’m adding the other to my list. thanks! Your list is amazing!! Shadow and Bone, Throne of Glass, Crown of Embers, Insignia! Love love love!!! A great list and a beautiful ornament! Thank you for sharing at Sharing Saturday! !